The passage of the Health Care Reform Bill has incited an angry reaction by rightist militants. These incensed and deeply aggrieved ill led people are self deluded uber patriots. They believe themselves to be striking a blow for individual liberty when in fact their actions consistently undermine the central tenants of our democratic republic. They are convinced that the new heath care legislation is America’s decent into a fascist hell led by Il Duce Obama; and are prepared to water the Tree of Liberty with the blood of tyrants and in some cases their own. They spit on and hurl racist and homophobic epitaphs at those they disagree with. Under the cover of darkness these imbecilic cowards have embarked on midnight drive-bys of the local offices of congress members who supported the legislation. They smash windows, fire bullets and leave threatening voice messages to let the politicians know of their anger and resentment. It’s an American version of a Kristallnacht. There are some interesting parallels with Kristallnacht that goes deeper then a convenient metaphor of broken glass. Though I don’t draw any equivalency with the severity and consequence of Kristallnacht with the rightists night of egg throwing and window smashing; I believe similar motivational ideals triggered the emotional response of the midnight ramblers and the Nazi zealots that authored the first chapters of Hitlers Final Solution. Indeed both are inspired and encouraged by pernicious and dangerous sycophants who are skilled practitioners in the fine art of The Big Lie. The Nazi’s were goaded into action by Joseph Goebbels; while our American Brown Shirts have Glenn Beck, Rush Limbaugh, and mainstream media giant Fox News to instigate a 24/7 anti-Obama diatribe that whips the ditto heads into anger fueled action. Right wing politicians like Michelle Bachman, Sarah Palin, Tom Tancredo and a growing number of far right conservatives freely use the rhetoric of armed resistance to any government initiative. They cull the support of angry Teabaggers and a growing Militia Movement that flies the Don’t Tread on Me flag. The latter are armed to the teeth and stand minuteman ready to exact swift retribution if you step on their toes. Radical conservatives have waged a Rovian campaign to delegitimize the presidency of Barack Obama through red herrings like the Birther Movement. The rightists deliberately work to confuse and frighten citizens to further their political careers and agendas. Like Joseph Goebbels they are skilled practitioners in the use of The Big Lie. The more outlandish the lie, and oft repeated the more believable it becomes. Since assuming the office of President we have been harangued with negative messaging initiatives by radical conservatives. Obama is a fascist. Obama is a Muslim. Obama is a socialist. Obama is the Antichrist. Obamacare will form death panels to conduct social triage. FEMA is building concentration camps to inter Teabaggers. Obama will confiscate your guns and take away your right to bear arms. Obama wants to address our nations school children indoctrinate them. Don’t fill out the census because it will allow the government to better track your movements and whereabouts. The incessant repetition of these ideas and the complicit silence of conservative leaders to refute them has served to delegitimize the Obama presidency and undermine our nations ability to converse and form a consensus to address the deep problems of our country. The political culture of America is a landscape of extremes. The growing fissures are making it more difficult to form any consensus. These fissures are exploited and exacerbated by competing media channels which define and shape political understanding and context. A shared political vocabulary and nomenclature of understanding is increasingly undermined by words and symbology that are appropriated by political factions. Meanings and concepts are codified to create a language and political context that is used to understand factional ideology to support a political cosmology that is understood and accepted by the faithful. This makes dialog even more difficult if not impossible because the language of political discourse across the partisan divide translates poorly and in fact helps to solidify the meaning of otherness. Martin Bubur’s “I and Thou” is an instructive work on how the objectification of the other leads to their dehumanization. Once a person is dehumanized, any action taken against them can be justified. Those on the other side of the isle are now the “other” who you cannot trust. We wrote about McCain’s pejorative use of “That One” to describe Obama during one of their presidential election debates. The “other” becomes an actual suspect lying at the root of the problem confronting the aggrieved. The problem of incompatible dialects and protracted partisanship eventually leads to the dehumanization of the other. It doesn’t take much of a leap to believe that the elimination or suppression of the other will lead to a final solution to our country’s problem. 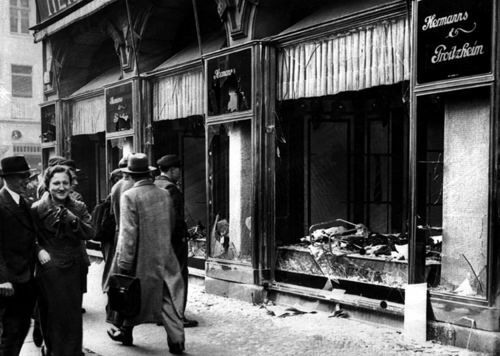 Kristallnacht was a watershed event in the history of German Nazism. In response to an assassination of a German diplomat in Paris the Nazi’s initiated a wave of terror against German Jews. On orders from Nazi zealot and the party’s Chief of Propaganda, Joseph Goebbels, a wave of hate fueled attacks were unleashed by gangs of SS , Hitler Youth and Gestapo thugs to attack and destroy the property of Jews. The pogrom resulted in the deaths of 91 Jews and 25,000 to 30,000 were arrested and placed in concentration camps. 267 synagogues were destroyed, and thousands of homes and businesses were ransacked. The broken glass that littered the streets from ransacked shops is how Kristallnacht (Chrystal Night) derives its ignominious name. Kristallnacht is understood to be the beginning of Hitler’s Final Solution, which lead to the Holocaust. It is certainly one of modern civilizations most shameful and tragic events. The howling yodelers of talk radio and the ministers of propaganda at Fox News intent on exercising their right of free speech by dehumanizing their opponents, inciting angry lemmings into vandalism, racist diatribes and vigilante terror are stoking the flames of a bitterly divided nation that threatens to immolate our badly divided house. More rightly this movement could be considered a Falange movement and is not without precedence in history. Falangism advances a reactionary agenda. Its violent temperament is nationalist and often religious in character. Falangism emerges in weak democracies and are symptomatic of a society in decline. Falangists promise a return to the prosperity and values of the past that are quickly dissolving in the embroiled clash of cultural, political and economic contradictions democracies find difficult to resolve. Glenn Becks’s Brownshirts need to understand that their misguided faux patriotism leads to some very dangerous and ugly places. Its easy to smash the glass encasing our fading constitution. Its more difficult to come together to address what needs to be done. I hope its not to late. I hope Mr. Beck’s final solution is not an historical inevitability for America.